2008: Iken is one of those fabulous spots that some people think of as their favourite Suffolk place. Others come across it by accident, as if it were a happy secret. And there must be many people, I suppose, who do not even know that it exists. The little thatched church on its mound jutting out into the wide River Alde is part of the panoply of Suffolk mysticism, an element in an ancient story of the birth of England, of grey mists and sad, crying wading birds swinging low over the mudflats, as if this were a piece of Benjamin Britten's chamber music made flesh. As you may guess, it is a place about which it is easy to wax lyrical. I had not been back to Iken for years. And then, in the summer of 2008, I got a telephone call from John Francis of Anglia Television. He was doing a series of features for the summer about places to visit and things to do in the Anglia region. Would I like to help with the one about Iken? On one of those hot, muggy days in July, when it seemed as if it might turn out to be a spectacular summer after all (it didn't) I headed up with my bike on the train to Campsea Ashe, and then cycled out through the narrow lanes beyond Tunstall. About a mile from the church, on the Snape to Orford road, a sign reads St Botolph's Church Iken Welcomes Pilgrims. Well, what more could you ask of any church? As I turned up the track which leads out to the end of the spit and the mound of St Botolph, a lazy barn owl pumped its wings across the field, looked at me with disdain, and then disappeared into the woods. John Francis and his camerman had seen it too, an appropriate introduction to the magic of this place. It turned out that John had got the idea for the feature from the original piece I had written about this church. As well as the church itself, I had described the walk from Snape Maltings across the lonely marshes. This is what I had written on that occasion. 2000: I hope I can begin to convey an impression of what this place is like. Iken, pronounced eye-k'n, is one of Suffolk's most extraordinary places, and anyone who has ever been here will never forget it. Here, the River Alde snakes through mudflats and around islands; the reed beds shiver and flow in the silence, and the avocet and curlew cry out in their isolation. As the seasons turn, and even as the day passes, it can seem different. Light plays exquisitely on the silver water, or the wind comes from far away, and on a cold winter's afternoon there are few places I'd rather be. You may have seen this church without ever visiting it. Its tower is the one across the marshes from Snape Maltings, and there is another sight of it on the main road to Aldeburgh. But these two civilisations are far away, and the dubious delights of shopping in the craft shops of the Maltings seem especially crass when viewed from here. On a gorgeous day in November 2000, I set off from Snape with my friend Malcolm, and my seven year old son James, his godson. We were planning to walk the footpath that veers away from the junction by the Maltings; although there is another, shorter footpath, which I will mention in a moment. The path we took heads straight towards the marsh, and then turns, following the river eastwards. Jimmy was soon in a world of his own, playing games in his head with the wilderness of reedbeds and thickets. After about half a mile, the pathway enters the marshes, and is carried through the mudflats by a mile or more of duckboards, the reeds and creeks encroaching on both sides. I suggested to Jim that it might not be such a good idea if he was to step off the boards, as this would lead to sudden death - or, at least, very muddy trousers. Taking the way of least resistance, the pathway veers from side to side, so that every time I looked up the tower of St Botolph was in a new position. We reached the edge of the winding river again, and you could see at once how the church and its two neighbouring houses are on the end of a spit that sticks out into the marsh, St Botolph itself on a little knoll at the end. 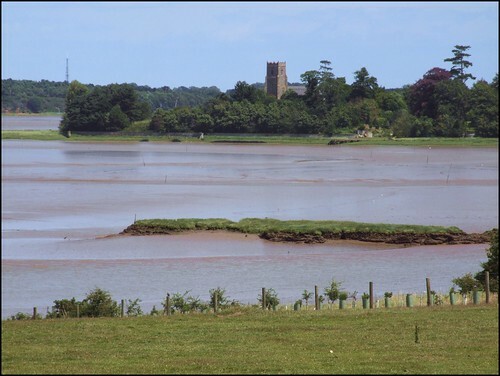 A narrow road runs along the spit, the only way to the church, unless you have a boat; and even then, you could only reach it at high tide, for at other times the river drains to a silver thread, leaving a vast shimmering expanse of grey mud to be picked over by wading birds. As the river fills again, you are sometimes rewarded with the sight of a marsh harrier, looming over small creatures forced higher and drier by the rising water. There is also the other designated footpath from Snape to Iken, as I said earlier; it cuts straight across the marshes, island hopping across the muddy creeks. You could only do it at low tide, and I think that in winter you could not do it at all. When we reached the point where it was supposed to join the path we were on, there were 20 metres or so of shiny, lethal mud spreading where it was marked on the map. We gazed at it. I imagined trying to cross it, and thought to myself that I would get about three, perhaps four metres. I simply wouldn't stand a chance. My children would come at low tides, to see the bony, skeletal hand protruding from the flat mud. "Look!" their mother would say. "There's Daddy!" I could tell that Malcolm was slightly disconcerted to see a footpath marked on a map disappear into grey nothingness. But then, he's from Derbyshire, he's used to the permanence of stone, not coastlines that melt with the seasons. From here, the full drama of St Botolph catches your breath. It is an ancient site. Well, that's easy to say, of course, and true of many churches. But the site of St Botolph really is ancient; you are looking at a place where there has been a church for almost 1350 years. This is almost certainly the spot where St Botolph came ashore in AD 654, and founded his monastery. Some people will claim the same honour for Boston in Lincolnshire, but don't listen to them. This place was then Icanho, and St Botolph and his monks set out across east Suffolk to evangelise the pagans under the direction of Felix, first Bishop of East Anglia, from his Cathedral at Dumnoc, probably Walton Castle. Botolph died at or near Burgh, where he was buried, probably in an attempt to exorcise evil spirits; the corpse was later translated to Bury, where the monks knew a pilgrimage opportunity when they saw one. The church as we see it today is in three parts. The most ancient bit is the nave, albeit restored; it dates from before 1200. The chancel, like all others in England, fell into disuse after the reformation. By the 18th century it was ruinous, and was demolished and rebuilt in 1853. The tower is a good one of the mid-15th century, very much in the Suffolk style. The church sits in its pretty churchyard across a private road; this caused a considerable problem a few years ago, as we shall see. The funny thing is that, although this churchyard is surrounded on three sides by the marshes, and the river spools around it like a cord of mercury, the Alde still has six miles to go to reach the open sea from here. A mile to the east, it reaches Aldeburgh. In St Botolph's day, this was the river mouth, but now the river turns back inland, and heads south. As if this wasn't contrary enough, it changes its name to the Ore.
After running parallel to the coast for three miles, it reaches Orford, where it formed a natural harbour in medieval times. But that, too, is now blocked, and the river slinks westward of Havergate Island for another two miles, coming out to sea at Shingle Street, just north of the Deben estuary. This is a secret world, full of hidden creeks and inlets. About twice a year, the local papers report that coastguards have caught boats on this river attempting to avoid duty by running tobacco or alcohol ashore. The field immediately to the north of the churchyard contains two Highland cattle, surprisingly. Well, it certainly surprised me. It surprised Jimmy even more; he thought they were yaks. The sky had changed; a grey leaden colour seemed to have condensed out of the icy blue. We stepped inside. Low benches line the north and south walls. To the west is the great font, one of the best in the East Anglian style. The angels that alternate with the evangelistic symbols carry the instruments of the Passion. Beside it, another large object is hardly discernible in the darkness. The walls to north and south are blackened, calcified; the plaster has almost all gone, and we are left with the rubble core, common to all Suffolk churches, but normally hidden. What happened here? On the afternoon of the 4th April, 1968, a gardener clearing the churchyard lit a bonfire to burn rubbish. Sparks from it caught the thatched roof of the nave, and within minutes the whole place was alight. In this remote spot there was no prospect of a speedy rescue, and the church completely burned out, leaving a shell. It took twenty years for repairs to be completed to the extent you find them today, because a dispute over access meant that materials had to be carried by hand from the road; vehicles were not allowed through into the churchyard. First, the chancel was restored for use as the parish church. A rather ill-fitting partition separated it from the ruins. Later, a roof was put on the nave, and the font (which had been removed to protect it from the elements) was returned. But the interior of the nave could not be protected, and for a decade or more it was exposed to the Suffolk winters. And that is how you find it today. On my first visit, I noticed that the person before me in the visitors' book had written a true taste of the medieval! Poetic, but complete nonsense of course. In the Middle Ages, this church would have been alive with light and colour, of the flicker of candles and the smell of incense. The walls would have been covered with brightly coloured paintings, the bare shadow of one still surviving behind a glass screen on the south wall today. No, what we see today is more primal, ageless. The architect of the restoration was Derek Woodley, also responsible for the magnificent extension at Kesgrave All Saints. On the south wall is the war memorial. It is stunning to realise that this tiny hamlet lost ten men in the First World War. There can barely be that many men living in the whole parish today. With your back to the nave, the chancel is of a homely, dull character. Johnson's engraving of 1818 shows it in ruins. There is a picture of this in the excellent guidebook; surreally, another picture shows the church after the fire, exactly the opposite of Johnson's engraving, with the chancel whole, but the nave in ruins. Only the tower stands in both, and that was restored as part of the post-fire work. And that's where we come to the most interesting thing of all about Iken, for the large object by the font is nothing other than part of a Saxon cross, discovered in the superstructure of the tower when it was restored. It is the bottom 1.5 metres of a cross that must have been about 3 metres high, and the tenon that connected it to the crossbar survives. It probably dates from the 9th century, and may have been raised on the site as a commemoration after the Vikings had destroyed the original monastery. The most interesting side faces the wall, unfortunately: a curled dragon bites his own tail, but keeps his beady eye on you. Sorry to harp on about the visitor's book, but another major mistake made by people leaving comments is to describe the cross as Celtic. This is, I think, a result of the way we have been conditioned in the modern era to think of the Celts as 'New Age' artists and mystics, but the Saxons as dull, plodding farmers. This is, of course, also absolute nonsense, as a sight of the Sutton Hoo treasure in the British Museum will show immediately. Saxon art was gorgeous: intimate and intricate, mysterious and beautiful. All too soon, the Normans would come along with their big ideas and corporate imagery, but it was the Saxons who built the English imagination, and anyone who tells you that the work here at Iken is Celtic should be immediately disavowed of that notion. Today, the tiny congregation regularly use the chancel for services, but the nave has become a haven for pilgrims, who make their ecumenical way here in droves, if the visitors book is anything to go by. They return to where the story of Suffolk Christianity began. Across the shifting, shimmering mudflats, the failing light enfolds a beating heart, for St Botolph's journey has come full circle. 2008: Coming back, the most striking change is that the nave now has 19th century benches in it. I was a little surprised by this, as they seem quite out of keeping with the atmosphere and sense of the place. I prefered it when it was completely empty, but I suppose that the church has become something of a victim of its own success. But surely modern wooden chairs would have been better? Well, we recorded our piece. It took about an hour, but will doubtless be condensed down to about two minutes, as such things are. While the general shots of the interior were being taken, I wandered around outside, and found, to the east of the church, that there is now a memorial to the writer Julian Tennyson. His Suffolk Scene of 1939 is a stunning evocation of the county on the eve of the outbreak of War. He was just 23 years old when he wrote it, and it is a young man's book about an ancient county. It is probably one of the best books written about Suffolk in the 20th Century. Sadly, Tennyson did not survive the war whose storm clouds he had noticed, being killed in Burma shortly before it ended. An extraordinary man, he was a grandson of the famous 19th century poet, although that is one of the less interesting things about him. I was pleased to find it, and it set me thinking about what Tennyson would find different about Suffolk if he saw it today, and what he would find unchanged. Over the fence to the north, the Highland cattle still roam, yet another pleasing continuity, and I knew that I would not leave it so long before I came back to Iken again.